"Hey this is me Mambo. I've been doing great in foster care and guess what, I've learned how to get along with other dogs and I am completely house trained. 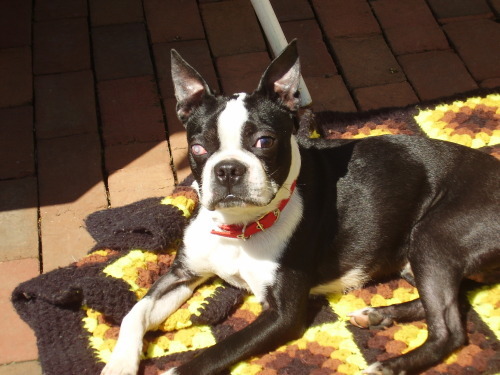 As you know I came from a shelter and I was very thin and had a dull coat. Now I'm just so handsome and my coat is beautiful. I live with my foster mom Linda who boards dogs. She taught me how to get along and play nice with poodles and big labs and rotties. I sleep in a bed with my brother and sister Bostons. I'm so special that a photographer who adopted a foster from the group took a video of me and I'm on Youtube. My name is Mambo for a reason. I know how to do the Mambo and the video is great so you have to check it out. I really need a family to adopt me. I know I have an ulcerated eye that is not pretty but it don't bother me so don't let it bother you. I still have another good eye. I promise I'll shower you with kisses and I even know how to sit for a treat. 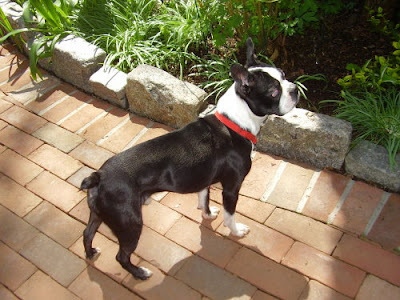 I'm a proud good boy and a perfect Boston Terrier." "David Sachs, and his daughter Allison came to see Mambo today. What nice people. I spoke with David over the phone last night for a good hour and his application was too good to be true. Mambo showered them with kisses and I showed them how Mambo rides a boogie board in the pool. Their dog Bindi (a beagle/italian greyhound mix) was a doll and played nicely with my dogs. exchanged a glance and she whispered let him take him now. I had typed the adoption agreement & addendum last night after I spoke to David on the phone and secretly knew I may let him take Mambo if he wanted to. Walking out front was hard. Diane couldn't come with me and my friend Joanne wouldn't even say goodbye to Mambo. Mambo and Bindi sat with Allison in the back and I smiled when he showered her with kisses again. After they left although the tears rolled down my cheeks, I knew I did the right thing. It wasn't about the 1.5 hour trip I would have to take to deliver him, it was about the perfect family who picked Mambo despite his ulcerated eye. They couldn't believe anyone would be afraid of it or think it was ugly. Mambo definitely hit the jackpot. I know he totally hit the jackpot, I spoke to Karin Sachs for over an hour tonight and she is totally in love!!! Hurray for happy endings. Mambo is so mint wonderful they are going to love him and spoil him. Couldn't have happened to a better family and a better DOG!!! Mambo is doing well and will of course sleep with them tonight. It doesn't get better than that. I miss my baby boy and its always hard making one less bowl during feeding time but I'm so pleased with this adoption. I call it rags to riches!!! Thanks for this appy Jodi & Beth and Linda thanks for the hc. They loved your video Joan!!!"